The Civic District and parts of the Central Business District (CBD) will be transformed into a car-free zone for the first time on Feb 28. The area will host an array of activities, including mass aerobic workout sessions, walking tours and street performances by lion dancers, stilt walkers and more. The six-month pilot will extend to July, and the car-free day will be on the last Sunday of each month. Having spoken last month about how Singapore needed a cultural shift towards a car-lite future to be more sustainable in the long run, National Development Minister Lawrence Wong said in a blog post yesterday that this initiative will take the vision a step farther. "It will take tremendous effort and time to make our vision a reality. But if we want a future city that's cleaner and greener, and provides an even better quality of life for all, we must start to make changes now." The first Car-Free Sunday SG will kick off at 7am in front of the National Gallery Singapore, with a mass walking, jogging and cycling event along a 4.7km route of fully and partially closed roads. 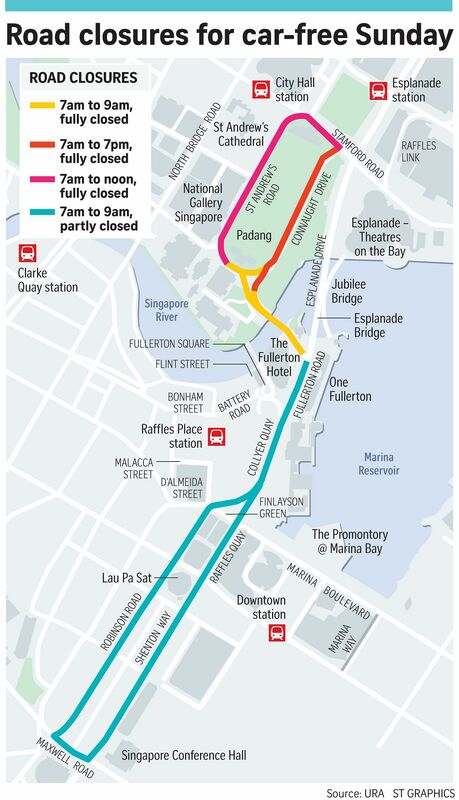 Streets, including those around the Padang and Fullerton Road, will be fully closed to vehicles from 7am to 9am. Shenton Way and Robinson Road will be partially closed. To make way for other activities such as yoga sessions, origami for kids and street performances, St Andrew's Road and part of Stamford Road will be closed until noon, while Connaught Drive will remain fully closed until 7pm. The routes of 13 bus services will be diverted during the event. Mr Andrew Fassam, senior director of urban design at the Urban Redevelopment Authority, said the CBD was chosen to pilot the initiative because it has very little traffic on Sunday mornings, and is also easily accessible by public transport. "People can also cycle into the city along the park connectors and from the Singapore River, so it is very easy for people to come down and take part in the event," he said. In fact, amateur cyclists are encouraged to take the chance to try out cycling as a means of commute, said Mr Fassam. And they can search for people to ride with on the Love Cycling SG Facebook events page. Also, the Urban Redevelopment Authority has placed a map highlighting the different cycling routes to the CBD on its website, along with details on the various activities for Feb 28. The National Gallery Singapore, Asian Civilisations Museum (ACM) and Victoria Theatre and Concert Hall will be opening earlier - at 9am instead of 10am - for the event. Fresh graduate Chew Kai Wei, 26, said he intends to go to the area on that day. "It's something novel and sounds like a great way to spend time with family and friends."